Infographic: Are You Getting Enough From Your Remote Support Solution? 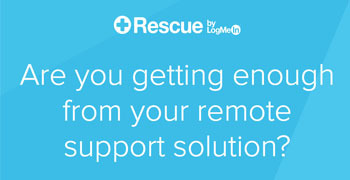 Resources Infographic: Are You Getting Enough From Your Remote Support Solution? There are many ways to provide remote support, but not all solutions are created equal. In a world where people expect support to be always available and always efficient, organizations can’t afford to waste time with tools that are slow, cumbersome or incomplete. When evaluating your team’s current or prospective solution, you need to look at more than just its features and also consider the results you can achieve by using the tool.